When I divorced I created a couple of traditions in my family to strengthen the relationships between my daughters and I, as well as between themselves. I started a weekly family night and regular hang outs where each of them get to spend time one on one with me. Being a single mum there isn't always a lot of money to go around so for family night we started playing more games. I loved board games as a child and want my children to experience them as well. 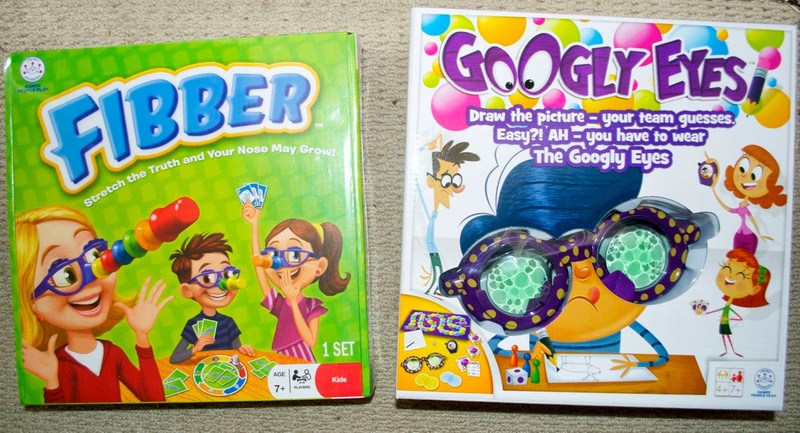 Recently I was sent Fibber and Googly Eyes to review. My kids adored Googly Eyes. It's a simple game covering all the aspects kids love such as drawing, a timer, a humorous way to do it all and the competitiveness of teams. We've played with friends of theirs too and it is perfect for their age grup of 4 - 7 year olds. It's funny to see how people think they are drawing and the guesses other make about the picture. There are 3 levels of difficulty for the googly glasses to make it harder for older ones. Fibber was much loved too except my kids are not so great at lying, which is fine by me. They giggle hysterically when they have 'fibbed' so I did a lot of pretending in this game. They loved the concept of their noses growing from fibbing, much like Pinocchio. These two games I will get a lot of use in our house I suspect. Have you tried them? What are some favourite games in your household?